Having just completed my third Andrei Tarkovsky film in a week, the man still continues to leave me in awe. His 1979 science fiction masterpiece (yeah, I'll use that term again) Stalker is the toughest viewing of his impressive resume I have experienced to date, but I kept thinking to myself throughout that I was likely watching one of the greatest films of all time. 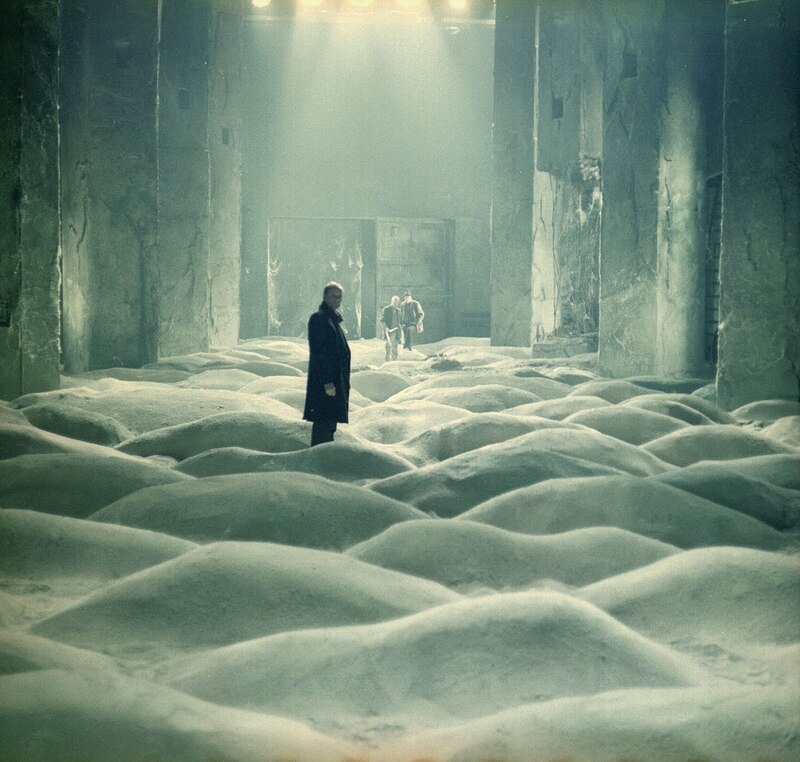 There are few ways to describe the extraordinary visuals Tarkovsky manages to capture here, and the feeling of suffocating suspense and anticipation that keeps you glued to the screen. Very little happens, but based on the advice of the central character, it is what could happen that you eagerly watch for. I absolutely loved the first half, but once the characters reach the cusp of The Room in the concluding third, I wound up a little disappointed. Intriguing questions begin to stew inside your brain, but after such a wonderful build-up, I really hoped for something special to end this journey. 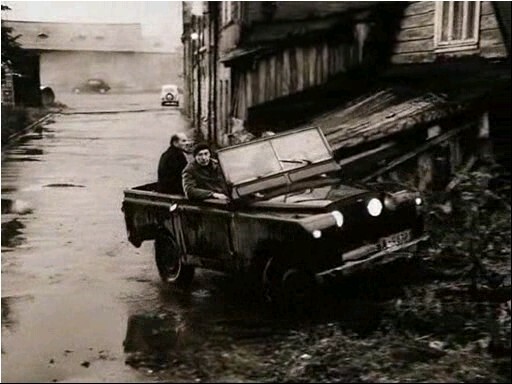 Nevertheless, Stalker is a film you have to experience. The screenplay is written by Boris and Arkady Strugatsky, based loosely on their novel, Roadside Panic. A haunting Dystopia, Stalker is set amidst the decrepit ruins of an unnamed town, situated on the outskirts of a quarantined and heavily guarded sector known as 'The Zone'. Inside there is believed to be a Room with the power to grant any believer who enters, their inner-most desires. The story depicts an expedition led by a 'Stalker' (Alexander Kainanovsky), a guide who has chosen to dedicate his life escorting curious travellers past the armed barricades, through the danger-riddled sector to the aforementioned 'Room'. Following the events of an undefined previous occurrence, which led to the depopulation of the entire area, the otherwise mundane rural area has been transformed into a government cordoned region, uninhabited but fraught with dangers sensed but rarely seen. The film opens in sepia, with the Stalker rising from his bed in the middle of the night to leave for his assignment, a role his clients pay handsomely for. His wife urges him not to go because of the legal consequences of being caught, but he ignores her and leaves for a local bar, where he meets his clients, known only as The Writer (Anatoli Solonitsyn) and The Professor (Nikolai Grinko). The border of the Zone is protected by barbed wire fences and armed guards, and the trio try and evade the military blockade and enter the Zone using a Range Rover. Attracting gunfire, they manage to follow a train in through a set of briefly opened gates and then ride a railway work car into the heart of the Zone. During this final journey the camera lingers for minutes on the faces of the three men, as they emerge from the darkness of the night into daylight and the image transforms from sepia into full colour. The Stalker, looking frequently distressed throughout the course of their expedition, instructs his clients to follow his orders exactly to avoid and survive the dangers, though invisible, that surround them. He plots their course through the lush greenery by throwing a nut tied to some string to ensure there are no gravitational anomalies. Frustrated bickering and disbelief begins to emerge amongst the other two men about whether these elaborate precautions are necessary and the reasoning behind taking an extended and seemingly more perilous journey to The Room. As a viewer you are also constantly questioning whether or not what The Stalker believes (he relays the account of his mentor and his previous experiences within the Zone) are genuinely acceptable. It is stipulated early that an army platoon had entered the Zone shortly after the event and never returned. Throughout their journey the men come across a number of rusted tanks and skeletons, implying that previous insurgents had resulted in deaths. The land is actually lushly covered by thick green grass, and though scarred with wreckage and riddled with rain-drenched bogs, seems peaceful and deserted. 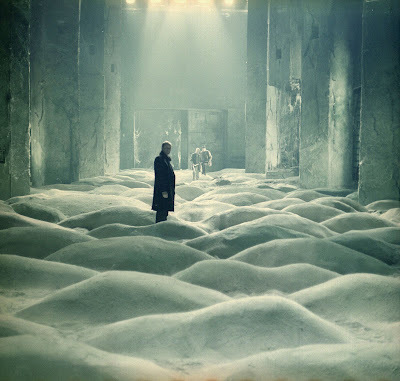 But there is every possibility, based on what we are informed about by The Stalker and what Tarkovsky reveals with his camera, that the calm and quiet expanse masks sinister natural and unnatural elements within. It is this atmosphere of heightened tension that makes the film so engaging. The fairly laborious forward (and often backwards) motion is accompanied by several deep philosophical discussions where the characters share their reasons for wanting to visit The Room. The cynical and burnt-out Writer appears to have lost inspiration and hope, while The Professor claims to desire winning the Nobel Prize, though his true intentions are later revealed. One lengthy discussion takes place when the men are laying out and resting on a waterlogged plain. They sleep uneasily and contemplate their journey (both what they have encountered, and what lies ahead). I thought that Stalker, quite philosophically, analyses the confusion individuals face when asked to pursue their strongest personal desires and criticises the instability of human nature's faith in themselves. The Stalker has come to realise, after countless expeditions, that only the most flawed and troubled men are willing to sacrifice themselves for their inner-most desires. Have they lost all hope in being able to live happily and content with their lives? Faced with fear of the possibility of having the darkest of human desires come to fruition within the room, he has never entered The Room himself, nor had any desire too. In the latter half of the film, though, he begins to face his own crisis. Just as important as the journey itself, these philosophical discussions are equally compelling. Passing through an underground tunnel The Stalker calls the 'Meat Grinder' the trio arrive amidst a crumbling ruin and at the cusp of The Room. The sequence of events that follow are intriguing, perplexing and likely to prove unfulfilling and disappointing for a lot of people. In turn, each of the trio analyse their own thoughts about The Room; the implications of entering and the fear of witnessing their desires come to fruition, whether The Room should exist, and who Stalker really is. On my first viewing I was a little disappointed by the conclusion, considering the wonderful build-up. 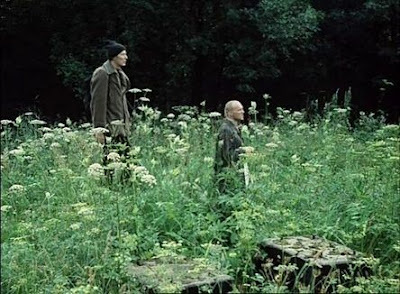 But, since that viewing, Stalker has lingered with me ever since, and I now accept that this is an amazing film and one that metaphorically documents life as a continual quest for the truth. The haunting accompanying score by Eduard Artemyev builds a tense atmosphere. But I found the absence of a score to be just as memorable. Every minor sound affect, be it the footsteps of the characters as they ascend or descend stairs or splash in puddles, is magnified. Often the boundaries between music and sound are blurred, as natural sounds and music interact to the point of being indistinguishable. 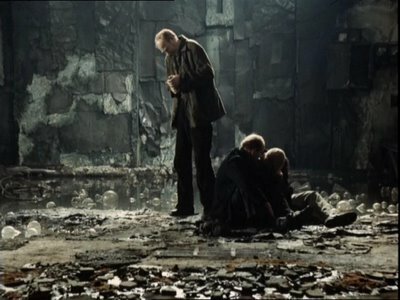 Very often too, the score and the character's dialogue (Stalker quotes the New Testament) is disconnected from the image. But in nearly every sequence, you will recognise that Stalker is a work of audio and visual mastery. I don't want to go overboard, so I'll wrap it up. Stalker is a very tough experience, but there is an ethereal, hypnotic quality about the film and it's essential and rewarding. Andrei Tarkovsky was a genius, it's as simple as that. I loved this review, really well written and insightful! by the way, this one definitely is long and at times hard to get through, but I can assure that Nostalghia is his toughest film to get through, will you be watching that one as well? Thanks Jack. I have had a great week with Tarkovsky, but I have never felt more drained or tired. The viewings are an ordeal, but so are the write-ups haha. I hadn't considered watching Nostalghia. I was just going to stick with Solyaris and The Silence! But i'm not sure I could sit through that one, by the sounds of it. 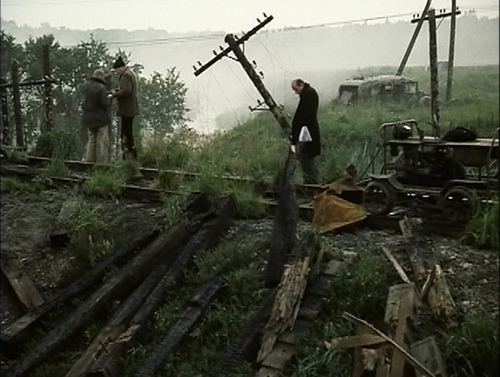 @Lime(tte) - Tarkovsky is definitely a director to take an interest in. Each of his films are different, but rewarding in their own way. I would start with Andrei Rublev, and then work through his 70's films. But this transition isn't necessary, each film is a masterpiece on their own. I have two more of his films to watch and review, but for the rest of the next week i'll be reviewing some new releases (Paul, Incendies and Brighton Rock). Thanks for reading guys. Have a great weekend! I watched it yesterday and yours is an excellent review. I loved the movie, though I have to confess, it's a little dense. I'm still thinking about the daughter, she was a mutant, and what is more astonishing for me is that I see the Zone as the exclusion zone of Chernobyl, though the catastrophe was in 1986, the film is like a prophecy. Beautiful. Ah, I was expecting them not to enter the room, so I wasn't disappointed. Because the inner desires could be not good at all. Yeah, it is very dense and I had no idea where it was going, but initially I was a little disappointed they didn't enter the room. On re-watches though I feel like it ends perfectly. 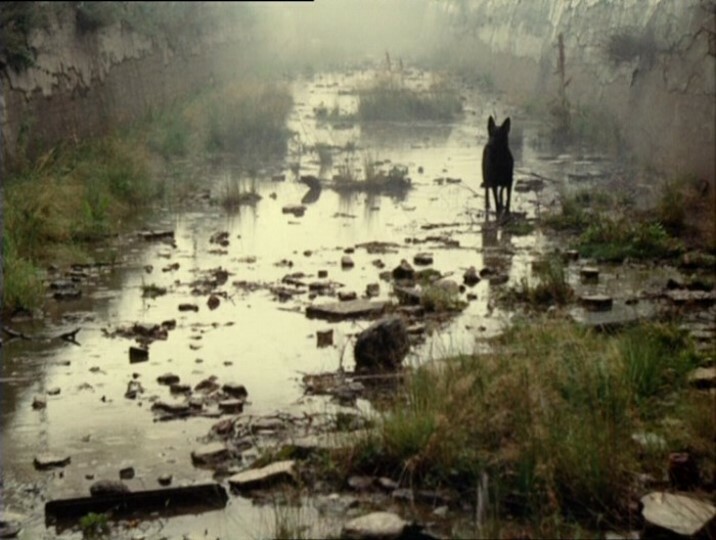 The fact that the zone is a prophecy to Chernobyl is a really thoughtful idea, and just goes to show how gifted Tarkovsky is as a filmmaker, crafting a mesmerising film that becomes even more significant as the years pass. Thanks for reading. I appreciate the comment and glad you loved the film as much as I.
Australian Premiere of "Sucker Punch"